Ann Arbor Transportation Authority board meeting (June 23, 2010): The board’s regular monthly meeting in June was the last one to take place at the AATA headquarters, located on South Industrial Highway. In the future, regular meetings will take place at the Ann Arbor District Library – on Thursdays instead of Wednesdays. The AATA will be taking advantage of the videotaping facilities at the library. Moving the meeting location is part of an effort to make the board and the organization more accessible as the AATA begins engaging the community about developing a transportation master plan (TMP). A presentation on the countywide TMP from the AATA’s consultant and its own staff who are working on the project was a highlight of the board meeting. Board members focused on the need to have a vision of what the community would like in 30 years, and to start taking the short-term steps to get there, instead of dismissing a 30-year vision as impossible because there is no funding available now. The completed TMP document is expected by early 2011. The board marked a transition to its new composition by honoring Ted Annis and Paul Ajegba, who were recently replaced on the AATA board by Roger Kerson and Anya Dale. The board also elected new officers to replace Ajegba and Annis as chair and treasurer of the board, respectively. Sue McCormick was elected treasurer. The board will be led by its new chair, Jesse Bernstein. At a media roundtable before the June 23 board meeting, AATA staff briefed representatives of the media on the development of the transportation master plan for Washtenaw County. The presentation they made to the media was essentially the same material that they presented to the board an hour later. Among the staff were Michael Benham – originally brought on board at AATA to manage the WALLY project, a proposed Howell-to-Ann Arbor commuter rail. The TMP is also part of his responsibility. He was joined by Juliet Edmonson, a planner with Steer Davies Gleeve, the consulting firm hired to help develop the countywide plan. Mary Stasiak, manager of community relations for AATA, also made part of the presentation. CEO Michael Ford was on hand to answer questions as well. Stasiak began by ticking through some of the recent background to the current effort to develop a plan for expanded countywide transportation service throughout Washtenaw County. One general theme reflected in Stasiak’s remarks was one where momentum had been building for a countywide initiative, but that the board had taken a step back. On this last point, board chair David Nacht stressed its importance to a millage on the ballot: “What are we selling that new taxes would buy?” Board member Sue McCormick echoed this sentiment, stressing the need to describe what would be delivered and at what price. The board then essentially paused the countywide initiative until it had filled the vacant CEO position, which it accomplished in June of 2009. Stasiak ticked through some important milestones over the last several months that had led the AATA to the present point of development of a TMP. A significant result from the survey that had been conducted, Stasiak said, was that 40% of people in Washtnenaw County had actually used AATA services in the last year. The survey firm was really surprised – typically it’s 10-20% of the population. Another significant survey result was that 75% believe that public transportation is either extremely or very important to the quality of life in Washtenaw County. But support of investment in expanded transportation was gauged at only 56%, Stasiak said. So the idea was to create a transportation master plan so that people know what they would get for their investment. It was felt that the survey results were not as strong as they might have been if people were reacting to a specific plan they’d helped to create. Meetings had begun in March of 2010, Stasiak said. Michael Ford had held 34 meetings with 59 people and had 48 more meetings scheduled through mid-August, she said. Later, during the board meeting, Ford showed board members a map that was being used to track all of his meetings, which he dubbed: “Where’s Michael?” Ford characterized the strategy of his meeting personally with others in the community as “not a one-time shot just because of the countywide initiative.” It would be part of what he’d do, he said, on an ongoing basis. During the media roundable, as well as during the board meeting, Michael Benham put the countywide planning effort into the same kind of context that Ford had described for his many meetings. Benham stressed that Ford has made clear it’s not an isolated effort, not a one-time event, where it’s developed and then implemented, and it’s over. The AATA planning cycle is one where the outcome is to be monitored and the plan is then adjusted. Even a single bus route change, Benham said, is to be subject to this monitor-and-adjust approach. At the center of the process, Benham said, is an engagement process with citizens as the plan is developed – he cited board member Jesse Bernstein’s call for the process to be transparent, open and flexible. Juliet Edmonson, transportation planning consultant with SDG, described the timeline for the development of the plan. July 2010: Develop vision objectives for short, medium and long-term goals – 30 years into the future in very general terms. What do people want to see in terms of public safety, economic vitality, urban sprawl, and health. From understanding that, it would be possible that transit helps realize goals. Audit the existing situation and how it meets community needs. Look at the forecast for the next 30 years and see how those needs can be met. July-August 2010: Look at the current transit system and develop a needs assessment. September-November 2010: Develop a list of options – some of which already exist – and evaluate those against the community’s values. Sift and package the options into different scenarios. Hypothetical examples of the kind of scenarios that could be produced are a paratransit-intensive scenario, a rail-intensive scenario, a low-funding scenario or a high-funding scenario. November-December 2010: From the set of packaged scenarios, develop the preferred scenario. 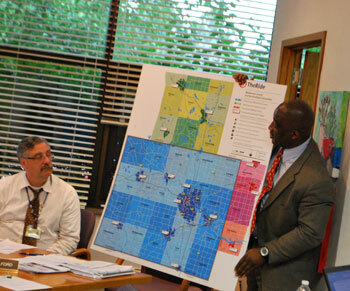 January-February 2011: Develop a Transit Master Plan, review of funding opportunities and implementation of plan. The process will be permeated with public process throughout, Benham stressed. There are three different audiences, he said: (i) champions – community leaders who are visible and respected in the community, who will spread the word into their own networks; (ii) technical committee – planners and transit operators in the area; and (iii) general public – individuals and organizations. There would be ongoing board/staff consultation throughout the process, Benham stressed. Drivers, for example, might hear riders say, “Gee, I wish this route went 1/4 mile further down the road,” and that kind of feedback would be continually fed back into the monitoring and planning process. In July, Benham said, there would be 24 total meetings: four that were geographically targeted for the four quadrants of the county, 1- to be held with specific organizations, with 10 meetings reserved for “wildcards” that could be scheduled in response to community interests. In September there will be another 20 meetings, he said, five each in Ann Arbor and Ypsilanti and two each in Manchester, Chelsea, Saline, Dexter, and Milan. In January and February of next year, Benham continued, there will be another 20 meetings with the same geographic distribution as the September meetings. Stasiak added that strategies for getting the word out would include other media roundtables and a variety of advertising, social media, the website movingyouforward.org, newsletters and direct mail. Benham stressed that newsletters and direct mail are crucial – not everyone does Twitter/Facebook, he noted. After the presentation, reporters at the roundtable had a number of questions. Question: On the FAQ about the TMP there’s a question that asks if the master plan would replace any current plan. The answer is no, it’s going to integrate them all. But surely of all the plans – Fuller Road Station, WALLY – something is going to be de-prioritized. Based on what you’ve heard so far, what would be leading contenders to be de-prioritized, or to become greater than what has been anticipated? Benham indicated that things were not far enough along to say, yet. He noted there’s going to be a lot of big ideas, or small ones – putting Zipcars at Briarwood Mall, for example. TMP: Amount of Detail in the Final TMP? Question: Engaging the public to elicit the “right” level of detail for the planning phase that you’re in will be a challenge during the public meetings that will stretch across the various planning phases. How much detail do we get in the final report? Will it have lines on a map with routes and stops? Benham indicated that the final master plan would have as much detail as required to evaluate the specific project. If it’s a route improvement, he said, then the route would be named and they’d specify the improvement. If there were a recommendation of adding a park-and-ride facility, the plan would at least identify a geographic area, if not a specific parcel of land. Edmonson noted that the plan would cover a span that ranged from implementations in the next two years on through 30 years. The things that will be implemented in the short term will be much more detailed in the TMP than those things that might be implemented in 20 years’ time, she said. Benham stressed that it goes back to planning as a cycle in which an element is implemented, but then continually monitored and adjusted. Question: Thinking about a 30-year timeframe, with a planning project like this, there’s a risk of putting everything on hold along the lines of, Oh, well we’re developing the TMP, so we don’t want to go ahead and implement a specific change right now. By way of specific example, Newcombe Clark, an Ann Arbor Downtown Development Authority board member, floated the idea of an express bus between Ann Arbor and Ypsilanti at his first board meeting in the fall of 2009, after he was appointed to that board. He has periodically mentioned this idea at DDA board and committee meetings over the last several months. Is an Ann Arbor-Ypsilanti express service something that can be contemplated before the TMP is complete? Michael Ford indicated that the question of Ypsilanti service was on the agenda for the board retreat coming up in July. They’d be looking at options for Ypsilanti, he said, but not in a vacuum – the topic would be considered in the context of the city, county, and the DDA. The idea was not, Ford stressed, to put everything on hold until the TMP was complete. Question: Jesse Bernstein has stressed that we’re not talking about money yet in developing the TMP – we’re talking about what we want and need and what our vision for that is. Ypsilanti, though, is asking voters to think about money – there’ll be a millage proposal on the ballot in the fall. To what extent is AATA planning to weigh in on the ballot proposal? Ordinarily you’d expect general support from the AATA for that proposal, but it might result in somewhat of a confusion of the AATA’s message about the TMP (don’t think about money) and Ypsilanti’s millage (please think about money). Stasiak indicated that AATA supports the investment of public transportation in Ypsilanti. Without it, she said, there would be thousands of people who’d find it difficult to get to work, medial appointments and school. It’s also not just an issue for the citizens of Ypsilanti, Stasiak said. Service to Clinton and Superior Township connects in Ypsilanti – it’s a regional issue, she concluded. TMP: View of AATA from Outside? Edmonson indicated she’d only been here 10 days, but has been very impressed – Ann Arbor is not a large city but has an extraordinarily good bus network. Drivers are helpful and friendly, she said. There’s technology that you find in leading cities, she said. She said it’s amazing to walk around downtown, but outside of downtown, Edmonson characterized it as “a tough environment for pedestrians and cyclists.” She said that during her several-months stay in Ann Arbor, she intended to use the bus, to cycle and walk, and perhaps use Zipcars. After the presentation at the board meeting, David Nacht focused on the slide that showed how the scenarios are developed – public input would be used to develop the scenarios, he noted. But the chart indicated that the process would move to a discussion based on technical expertise and what is feasible, he said. “What is the process by which you will bring to bear telling us what has worked and what hasn’t worked in other communities?” he asked the presenters. David Nacht asked about how the planning process for developing the transportation master plan would integrate the political feasibility of an eventual plan. He wanted to know the process by which AATA can test the scenarios with political and funding support realities – so that it’s something they can make happen. How do they get to something that makes practical sense that the can “sell” to make happen? he asked. Benham noted that some of the meetings would be directed specifically towards local legislative leaders. Edmonson added that public acceptance will be gauged towards the end of the year, in that phase. She noted that some transportation systems might be used other places, but might not be accepted and embraced here in Washtenaw County. Benham also noted that political acceptance would be addressed by public outreach, especially by “champions” who were involved in the process – they’ll write opinion pieces in the newspaper and speak to their friends and the public, he said. Nacht responded by saying that he was comfortable with the public input. What he still hadn’t heard an answer to, he said, was this: What’s the process by which they get SDG’s expertise in other communities, so that things are not rejected out of hand just because the public doesn’t understand them? And on the political side, he continued, we want to pick something that is likely to get funded, not just locally, but it should be something that feds might realistically fund 30 years from now. Jesse Bernstein, the newly elected chair of the board, spoke to that issue. This is a 30-year plan, he said. There may be short-term, mid-term, and long-term solutions that they come up with. The 30-year solution might be something they don’t have funding for now, but that they can work toward, Bernstein suggested. What kind of system do they want in 30 years? What kind of system do they want that will impact land use and development, and the retention of population? Those are the first questions, Bernstein said, and then they figure out short-, medium- and long-term solutions to get there. It’s okay to observe that “No one’s paying for that kind of system now,” Bernstein allowed, but maybe they say, “But that’s what we want.” Bernstein cautioned that they should not dismiss a vision because it can’t be funded now. Chairing the meeting at the start was Charles Griffith, who welcomed Roger Kerson to the board and said he hoped it would be a rewarding experience for him. [Anya Dale, the other new board member, was not able to attend the board meeting, but has begun attending committee meetings.] Griffith handed things over to Jesse Bernstein a bit later after new board officer were elected. 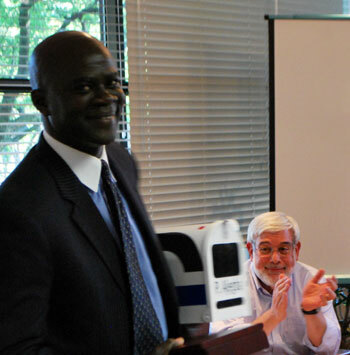 Former chair of the AATA board, Paul Ajegba, with the mailbox he received as a parting gift. In the background is Jesse Bernstein, who was elected the new chair of the board. As a parting gift, the AATA presented the two men with mailboxes painted to resemble an AATA bus, which is similar to the one the AATA uses at its South Industrial headquarters. Annis had already taken delivery of his box, but reported that he had not yet installed it. “It turned out to be a gigantic job!” he told the board. In the time since the previous board meeting, Griffith had accepted nominations for chair and treasurer of the board. For chair, he said, he’d received one nomination, “the gentleman to my right,” which was Jesse Bernstein. After asking for any nominations from the floor, and hearing none, and Bernstein was elected by acclimation to the position of chair. One name was also nominated for the office of treasurer – Sue McCormick – and there were no other nominations from the floor. Griffith said she could be elected, even though she was not present. McCormick was elected by acclimation to the position of board treasurer. Bernstein chaired the rest of the meeting. Later in the meeting, two resolutions expressing appreciation for Ajegba and Annis’ service on the board were passed unanimously. Board bylaws were the common denominator to a range of topics at the meeting. At the June 23 meeting, David Nacht indicated he’d be on vacation on Aug. 19. Several years ago, he said, he’d been away for the August meeting and had participated by phone. It was approved according to the bylaws. He wondered if the library had the technology to allow for that. Nacht was told it would be checked into. During public commentary, Clark Charnetski, who was there to deliver the report from AATA’s local advisory council (LAC), noted that the library had been made more accessible, because the removal of the flower box on the Fifth Avenue side had been completed and there is a new ramp to the William Street side. That should make it a lot easier to get from the A-Ride (para-transit) stop on William Street. People could watch for the mini-bus to arrive. He thanked the AATA for any role that they had in helping that process along. Bernstein said that staff had been diligent. Ford indicated that an intercom system would be installed in the library to aid in alerting riders of the para-transit system when their rides were there. Special meetings for any purpose or purposes may be called by the Chair. In addition, a special meeting shall be called by the Chair or the Secretary at the written request of two Board members. Such requests shall state the purpose or purposes of the special meeting. The regular meeting location time required a change in the bylaws, which was approved back in March 2010. Also related to bylaws was an issue raised by David Nacht in the context of the new chair. He noted that the former chair, Paul Ajegba, had appointed him to run a committee on reviewing the bylaws. He allowed that he had procrastinated and had not yet undertaken that work. The Board may appoint ex-officio members of the Board from time to time, as it may deem appropriate. The term of ex-officio members shall be two years. Ex-officio members may be removed or replaced at any time by four affirmative votes of the Board. With respect to board members’ accessibility, during his public comment time, Tim Hull told the board that even with the talk of and all the public outreach efforts in connection with the transportation master plan, he still had a problem with getting in touch with AATA as a whole. He said he’d wanted to contact the board, but told them there’s no way to contact any of them on the AATA website. It would take some hard-core Googling to find a way to contact them, he said, it was not on the AATA website. With respect to the TMP, he said, he’d heard them say that they wanted to include community leaders in the planning process – he asked them to also make sure they include typical riders and potential riders. He also suggested an idea he’s brought up before: there should be a citizens advisory commission like the local advisory commission (LAC), but tailored for fixed-route ridership, not just for seniors and those with disabilities [like the LAC is]. As it usually does, the board’s meeting included reports from committees and other public commentary. 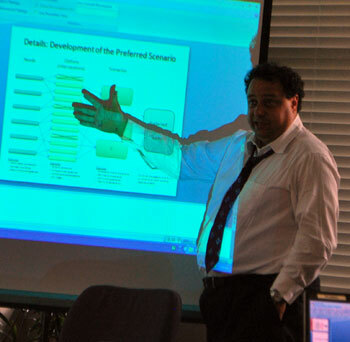 Rich Robben reported that the PDC committee had reviewed a 2011 work plan developed by staff – he noted that new board member Anya Dale had attended the committee meeting. Staff will be coming back to PDC with a final draft. He said that at the upcoming budget retreat, there are a number of decision points that need to be made on various topics: partnership with the University of Michigan; Ann Arbor-Ypsilanti service; hiring of more staff for the TMP; van pool for the county; WALLY; and Metro Detroit airport service. Jesse Bernstein reported that the committee continued to look closely at finance and utilization numbers. The AATA ridership numbers were following the nationwide trend of a drop in ridership, but the local numbers were somewhat better than the national trend. He said there was no indication that fare increases had an impact on lowering ridership. Bernstein reported that MichiVan is being discontinued in its current form – there are currently 88 vans running into Washtenaw County. Grand Rapids, he said, has a model where they opted out of the statewide program. AATA staff will bring recommendations on the possibility of adopting a similar model here. Bernstein concluded by reporting that work is progressing on the University of Michigan central campus transit center. The report from the local advisory council was given by Clark Charneski – in Rebecca Burke’s absence. The LAC’s major discussions had recently focused on changes to the A-Ride system that would improve efficiency and service – they realize it’s an expensive program, he said. The discussion had focused on things like pickup time windows and the number of days in advance you have to book services, he said. With respect to bus stops, Charneski said, there’d been a discussion of the Arborland stop – you have to cross Pittsfield Boulevard twice plus Washtenaw Avenue once to get from one side to the other, for a total of three streets. They also suggested an extension of the #2 bus route to add service to the University of Michigan’s east Ann Arbor clinic, as more and more medical procedures are being done at that location. Thomas Partridge spoke at all three times available for public comment – during the public hearing on the AATA’s capital and categorical grant program, and during two public commentary times. Partridge introduced himself as a resident of the state senate’s 18th District, for which he is a candidate in the Democratic primary to represent almost all of Washtenaw County and almost all of the AATA service area. He also introduced himself as a resident of one of the only affordable housing apartment complexes that is not served by AATA, and that is inadequately served by WAVE [the Western Washtenaw Area Value Express]. He called planning inadequate to connect services within one countywide system. He said he’d written a letter to the AATA board and to WATS [the Washtenaw Area Transportation Study] asking them to expand grant applications. He called the money for bus shelters as well as for seniors and disabled inadequate. He asked that the board take these grant applications back to the drawing board and bring in members of the senior community and the disabled community and rewrite the grant applications. As a candidate for the 18th District, he said, he’d been persistent and diligent in calling for unification of the county – economically, politically, and socially – by designing, resourcing and enacting bus transportation throughout the county. The countywide system should be linked with current bus authorities in the Tri-County area – Wayne, Oakland and Macomb. He asked that the AATA bring back the experts and attorneys that the board had invited to Washtenaw Community College for their December 2009 meeting and to have a countywide millage placed on the ballot. Partridge, during his final turn addressing the board, told them that it’s easy enough to draw up charts and flowcharts and computerized graphic presentations of a planning process, but it’s more difficult to reach the emotional issues involved. He called on public officials to become users of the system, saying that if the billionaire mayor of New York City can become a daily transit rider, then local officials could do so as well.